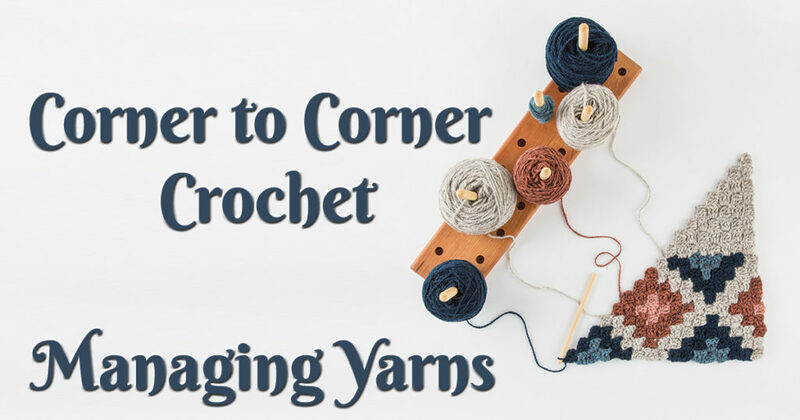 Weaving in ends is often the price you pay for a spectacular corner to corner crochet design, but there are a few ways to minimize your effort. For one, it’s not necessary to cut the original colored yarn after each color change. Keeping it attached whenever possible will allow you to pick it up again if necessary in the next row. Similarly, crocheting over the tails of yarn you do cut will significantly reduce the ends to weave in. My rule of thumb is that if the color of the tail matches either the tiles below it of the tiles I’m crocheting above it, then I’ll work over the tail. If, for example though, a tail is dark and the tiles below and above it are light, I wouldn’t crochet over it because it wouldn’t disappear enough into the light-colored yarn. In this case, I’d leave the dark tail to weave into a dark tile later on. At some points in a pattern, you may use several different colors in one row. This is when it can be helpful to have a few working skeins or bobbins attached to the project at once. By doing so, you’re able to pick up each color as it’s needed and then drop it (without cutting) when it’s time to switch colors. When dropping a color, make sure to drop it to the wrong side of the project so as to keep the right side free from any small yarn carries. 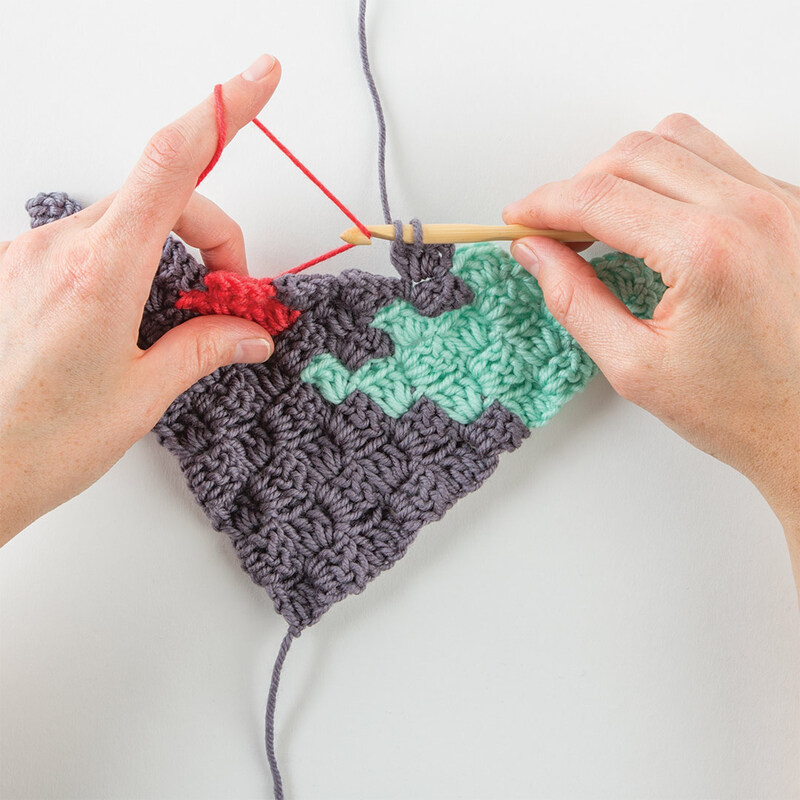 It can be helpful to place a safety pin or stitch marker on the right side of a project after you’ve worked a few rows. This way you can easily tell which side to drop the strand of yarn when switching to a different color. Find a tool that you like for creating small bobbins of yarn (read on for ideas) and then attach the bobbins to something that won’t allow them to roll all over the place. For example, if you wind bobbins onto clothespins or industrial clips, clip them onto a basket in the order you’ll need them in the pattern. Think of turning your work over like you’re re-reading the same pages of a book. If you turn the “page” from left to right at the end of one row, be sure to turn it back from right to left on the next row. This will prevent your strands of working yarn from twisting together after a few rows. If you’re just working with a couple of skeins of yarn instead of many bobbins, it can still be very helpful to contain them in a way that prevents them from rolling around. Place the skeins in a box or basket and begin each skein from the middle rather than the outside so that the yarn doesn’t need to roll each time you pull on the working strand (empty tissue boxes make great individual skein wranglers!). It’s bound to happen—you’ll get all tangled up in the yarn and start to feel like a fly trapped in a spider web. Don’t despair! 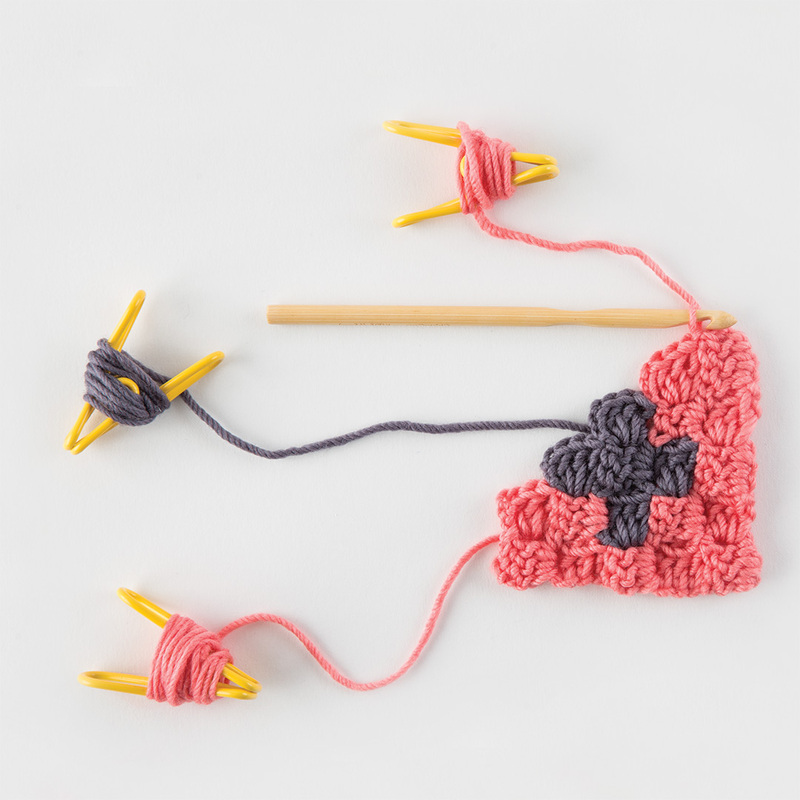 Take a couple of moments to straighten out your yarn every few rows or at the end of a session of crocheting. Worst case, you can always cut the yarn and reattach it to your project. This post is an excerpt from Corner to Corner Crochet by Jess Coppom. Featured Image: © F&W Media International, Ltd 2018.